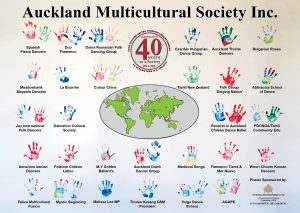 40 Years of the Auckland Multicultural Society Inc. – AMS Inc. The Society produced many educational booklets over the years which were produced and edited by our long serving secretary, Mr John Buckland QSM, M A Dip tchg. These were extensively used by educational institutions and government departments. In our early days there were no other organisations to promote unity and understanding of different cultures such as our Society, AMS played a vital role in promoting Multiculturalism in Auckland, we had about 40 ethnic groups in our membership. We gave performances of songs and dances all over Auckland. Held week long exhibitions at Auckland War Memorial Museum where primary and intermediate school children visited as educational tour. AMS encouraged to hold annual cultural performances at schools in Auckland. Today multiculturalism has been taken up by the government and local councils, and even schools have Multicultural day. Cultural performances were held in public venues and malls to strengthen AMS motives. Well settled ethnic communities celebrated their own cultural celebrations viz; Deevali, Chinese Lantern Festival and Pacifica festivals, resulting in fewer numbers joining AMS. Now, 40 years later with dedicated few members we concentrate on two activities: the Lakeside Multicultural Festivals at the Pump House, which has been providing free Summer entertainment over the past 21 years in the North Shore and a Multicultural Expo in Mt Eden held in August for the past 10 years at Mt Eden War Memorial Hall in Mt Eden. We also hold annual Christmas dinner with our members and friends of AMS. We annually collected Christmas presents for the Royal Oak Salvation Army. For the last five years we organised the Christmas dinner in conjunction with the Ruritanian International Folk Dance Club Inc.
As a celebration of 40 years of existence, the committee agreed to produce a big hand print mural, 2 metres by 2.5 metres, where a representative of each of those groups who participated in performing could put their hand print on the mural. The mural was designed and sponsored by Kesang Enterprises Ltd. After the printing, all participants were invited to a lunch at the home of President Thuten and Gwen Kesang, where the mural was laid flat and everyone was invited to put the their hand print on it. Certificates of appreciation were also presented to the participants after the lunch. The mural was hung as a backdrop during the 21st Lakeside Multicultural Festival and will be displayed there on future functions.